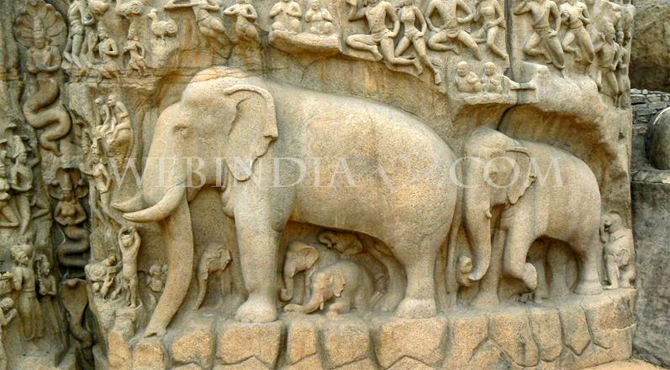 This marvel sculptured in rock is located at Mamallapuram, 58 km from Chennai, the capital of Tamil Nadu in Southern India. Approximately 96ft long and 43 ft high, carved in mid seventh century on the face of two enormous adjacent boulders, this is one of the biggest open-air rock sculptures in the world. Mamallapuram, once the ancient port of the Pallava dynasty who traded with countries of the far east, is now world famous for the splendid 7th and 8th century art and architecture of the period. Its monolithic rock sculptures, carvings, shore temple and wonderful beaches make the place a beautiful tourist destination. The skillfully carved edifice is named after the Epic Mahabharatha hero, Arjuna. The subject is either an account from the Epic Mahabharata, of how Arjuna, one of the Pandava brothers, performed severe austerities in order to obtain Shiva's weapon to destroy his enemies OR an illustration of King Bhagiratha's penance to bring the River Ganges down to earth to purify the souls of his ancestors. His prayers are answered and Lord Shiva sends the Ganges down to earth, but breaks her fall by allowing the water to trickle through his hair, so that the impact of its fall would not harm the earth. This strange sight is said to have aroused the curiosity of the world's animals, which gathered around the soaking God. The symbolism of the relief supports both these stories. Some of the popular fables from the Hindu Panchatantra books are also depicted. The vibrant festival of dance is held annualy in Mamallapuram from early January for four weeks. The sculptured figures on rock are remarkable for its vitality and naturalism and the skill with which they are sculpted. There are over 100 figures of gods and flying celestial creatures, birds and animals including giant elephants, human beings and saints in this beautifully sculpted scenario. There is a natural cleft between the two rocks separating the relief into two halves. The descent of the celestial river is represented by this cleft. Most of the figures of animals and celestial beings are carved either facing or approaching this cleft and generally with hands folded in adoration. The cleft is filled with a slab sculpted with male and female nagas (snakes), their hands held together in adoration, over which a contrived waterfall is fed from a collecting chamber above. On the left side of the cleft there is a four-armed deity, probably Shiva, his right hand holding a weapon, the left hand the showing the gesture for granting a blessing and attended by dwarf ganas (guards and followers of Lord Shiva). Just right to this deity of Shiva, a little below Arjuna OR Bhagiratha stands on one leg, with arms upraised, in a yoga posture seeking his blessing. Beneath this figure is a small simple shrine of Lord Vishnu in front of which sit sages, a buck and his doe and a lion and disciples engaged in austerities. A few animals are seen resting in their caves to the left. But the remaining lower left portion of this boulder is left un-carved. The Upper left portion of this boulder represents a mountain probably Shiva's abode in the Himalayas, where gods and animals are seen blended together. 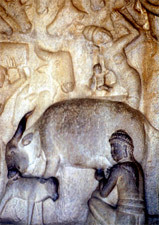 To the right of the cleft in the other boulder are seen numerous celestial beings and animals of which the most remarkable are the life-sized elephants protecting their young. Beneath the elephants there are scenes from the Panchatantra fables, such as the story of the cat doing penance by standing on one leg, trying to trick a group of rats. Just right of this exquisite relief, on a low platform, a group of carved monkeys are seen preening one another and playing and nursing a baby, which is also remarkable.